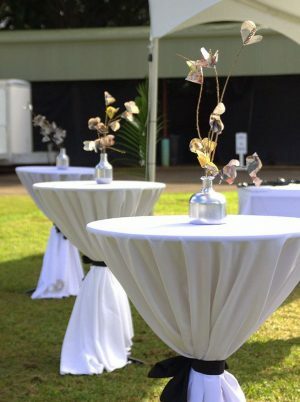 View our collection of belly bar tables (cocktail tables) for your wedding, baby shower, birthday, family picnic and any other event. This is our top of the line belly bar table (AKA cocktail) it’s a sturdy, premium grade wooden table that is perfect for weddings, cocktail parties, and other special events. Perfect for up to 3-4 people, this wooden cocktail table provides you with both 4 feet high and with a 30-inch diameter table. Choose this cocktail table with any of our linens (ivory, black or white) and let your party stand out in a fashionable yet elegant way. This is our exclusive white plastic belly bar table (cocktail table) available for rent anywhere in San Diego County. We also have linens that will fit this unique belly bar table!